Erin E. Weber is Adjunct Professor of Violin at Abilene Christian University and Hardin-Simmons University and recently finished a season with the Midland-Odessa Symphony & Chorale as Principal Second Violin and Second Violin of the Permian Basin String Quartet. She earned her Master of Music degree from Texas Tech University as a teaching assistant under Professor Annie Chalex Boyle and her Bachelor of Music degree from Southwestern University, where she studied with Dr. Eri Lee Lam. While at Texas Tech University, Erin performed outreach concerts in West Texas communities as a member of the Texas Tech University String Quartet and served the Texas Tech University String Project as a violin instructor and graphic designer. 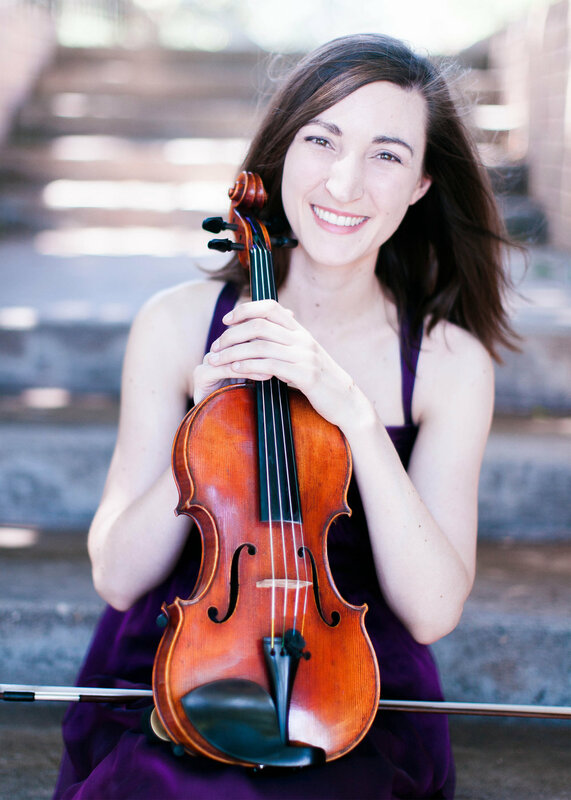 In 2009 Erin won the concerto competition at Southwestern University and was the featured soloist with the Amarillo Symphony Orchestra as the Amarillo Symphony Guild’s Young Artist competition winner in 2008. Erin has frequently accompanied chorales such as the Lubbock Chorale and Amarillo Master Chorale, and has performed chamber music concerts with Chamber Music Amarillo and as a guest artist of the Lake City Arts Chamber Music Series in Colorado. As an orchestral musician she has performed with multiple ensembles, including the Lubbock Symphony Orchestra, the Amarillo Symphony, and the Austin Civic Orchestra. Her previous orchestral leadership roles include serving as Acting Concertmaster of Lubbock Symphony, Co-Concertmaster of the Texas Tech University Symphony Orchestra, and Co-Concertmaster and Principal Second of the Southwestern University Orchestra. Erin has also engaged in several national and international music festivals, including the Round Top Festival Institute, Lake City String Academy, Hot Springs Festival, Madeleine Island Chamber Music Camp, and the IES Vienna Summer Music Festival in Vienna, Austria. She has had the privilege of performing in masterclasses for such teachers as Thomas Rosenburg, Paul Cantor, Charlie Castleman, and Kevork Madirossian. Her pre-collegiate teachers include Beverly de la Bretonne, who reared her in the Amarillo College Suzuki Program from age 3, and Dr. Keith Redpath. Nurturing students’ creativity and facilitating their musical expression through developing reliable technique are Erin’s principle motivations for teaching. Originally from Colorado, cellist Amy Huzjak has been a member of the Midland-Odessa Symphony & Chorale since September 2011, serving as Principal Cellist and as cellist of the Permian Basin String Quartet. Amy also plays with the Abilene Philharmonic Orchestra, Amarillo Symphony, Big Spring Symphony, and freelances throughout West Texas. Recent solo appearances include the Adagio of the Dvorak Cello Concerto with the University of Texas-Permian Basin, Shostakovich Cello Concerto No. 1 with the Abilene Christian University Orchestra and a duo recital in Dallas. She has a studio of over 30 students in the Midland/Odessa area and is the Adjunct Professor of Cello at the University of Texas-Permian Basin, Abilene Christian University, Hardin Simmons University, Midland College, and Odessa College. Kevin Smith currently serves as the Executive Director of the Abilene Philharmonic Association, and adjunct double bass instructor at Abilene Christian University and Hardin Simmons University. With a direct linage to the Guarneri violin makers, Mr. Smith has had a deep appreciation for orchestral music since a young age. He began his double bass studies at the age of ten and his early teachers included Cliff Wallach Greenberg, Serge Dor, and Gabriel Torres. Mr. Smith went on to earn his undergraduate degree from Florida State University where he studied with the distinguished Associate Professor of Double Bass, Melanie Punter. With a growing performance career, he has performed in numerous concerts with the Broward Symphony Orchestra, New River Orchestra, EChO (Electronic Chamber Orchestra), Rokafonik Philharmonik, and served as principal for the University Symphony Orchestra and FSU Opera at Florida State. After graduating from Florida State University in 2013 with a Bachelors of Science in Business Management and Music, Mr. Smith worked as the Operations Director for the Palm Beach Symphony. During that time he created the organization’s first Education and Outreach programs that reached over 12,000 students annually, managed the organization’s $1.3 million annual budget, and was successfully awarded the organizations first six grants totaling over $100,000. Most recently, Mr. Smith served as the Interim General Manager for the Lauderhill Performing Arts Center. An accomplished Eagle Scout, Mr. Smith enjoys camping, hockey, and college football.